Firstly, I must say that this Australian Autumn is perfect! The high temperatures are making it difficult to shoot Autumn looks over this side of the world, but it’s great to style outfits that also tie in with the European spring. 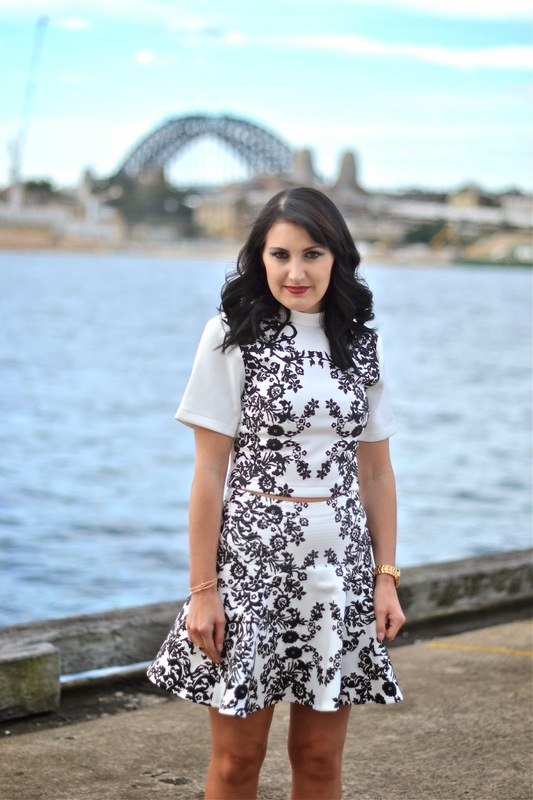 This weekend was my first shoot with fellow Sydney blogger Andrea and stylist Jo. It was also nice to be pampered by local make up artist Danielle. Pyrmont was a breathtaking location with views of the Harbour Bridge and city. It was exciting to explore a new place and loved the industrial feel with tram rails and docked boats. Since being in Sydney I have enjoyed getting to know new brands, and love taking a walk down Oxford Street in Paddington to visit the chic boutiques. The fashion here is much better than I anticipated and feel the customer service is that little bit more special with these smaller brands. The look I’m sporting is something that I wouldn’t usually choose as It’s way more girly than I’d usually wear! But I put my trust in the stylist and finished off the look with this awesome scuba jacket. Black and white is classic and powerful. My red lipstick made this outfit pop and thought styling it with black ankle boots made it a little bit more grungy. Delicate jewellery was all that was needed. I think anything chunky would have been way too much for this look. I’m excited to show you more looks from shooting with these ladies very soon! Stay tuned.